A new astrological year started on March 20, 2012, when the Sun ingressed into Aries, the first sign of the zodiac. The first new moon of this eventful year is electrified by Uranus in the early degrees of Aries. This is a good moment to restart the blog, especially as Urania, the muse of astrology, is sitting at the midheaven in the chart cast for Kotka, Finland, the place where I am writing. On Monday evening I watched a documentary film, Scott Walker: 30 Century Man, on television. It was almost a scary experience. Something that welled up from his unconscious obviously went straight into mine. I am old enough to remember the Walker Brothers from the 60’s, but I didn’t know anything about Scott Walker’s later career. He is an eccentric who avoids publicity, and his creative process is unique, like a shaman’s journey. We all are different and the creative process is different for each of us. The first degree of Aries is called the Aries Point. It is a sensitive point, which connects us with the world, and in the birth chart it can tell something about the native’s relationship to the public. Currently in the astrological sky Uranus and Mercury are at the Aries Point, and the New Moon (a conjunction of the Sun and the Moon) falls there too. Uranus symbolizes originality, creativity and sudden flashes of genius. It is sometimes called the higher octave of Mercury. Mercury represents the intellect, the mind, and it tells us something about how we communicate with others. Through our lives we are able to learn. We need to have contact with other people, and we also want to be understood by them. At the moment Mercury is retrograding, which offers an opportunity, for example, to reformulate a message, which in the past didn’t quite catch the listener. It can also expose us to confusion, for Mercury in mythology was a trickster. In Aries honesty is appreciated. Asteroid Hermes shares the same degree with Uranus. The Sun and Hermes are in parallel, i.e. the Sun and Hermes are in a latitudinal conjunction on the same side of the celestial equator. When two planets are in a latitudinal as well as longitudinal conjunction, like Hermes and the Sun in this case, it is considered a strong condition. Hermes’s presence is emphasizing the importance of thoughtful communication during the next month. Hermes and Mercury are embodiments of the same archetype, as Hermes is the Greek equivalent for the Roman god Mercury. Throughout the month we’ve been blessed with a conjunction of Venus and Jupiter in Taurus. Traditionally, Jupiter is known as the greater benefic and Venus as the lesser benefic. Venus is in her own sign and thus strong. Beauty and harmony, art and music are highlighted. A grand trine (three planets in easy aspect to each other) formed by Jupiter, Mars and Pluto makes things flow. In Taurus we can find also asteroid Hephaistos in a tight conjunction with Venus. In Greek mythology Hephaistos was the blacksmith of the gods. His Roman counterpart was Vulcan, husband of Venus. Many skillfully made pieces for the gods were hammered in his hot and smoky workshop. It is the place where the creative idea is put into practice. I would like to express my most sincere thanks to Eric Francis, Len Wallick, Chad Townsend and Anatoly Ryzhenko for their help and support. 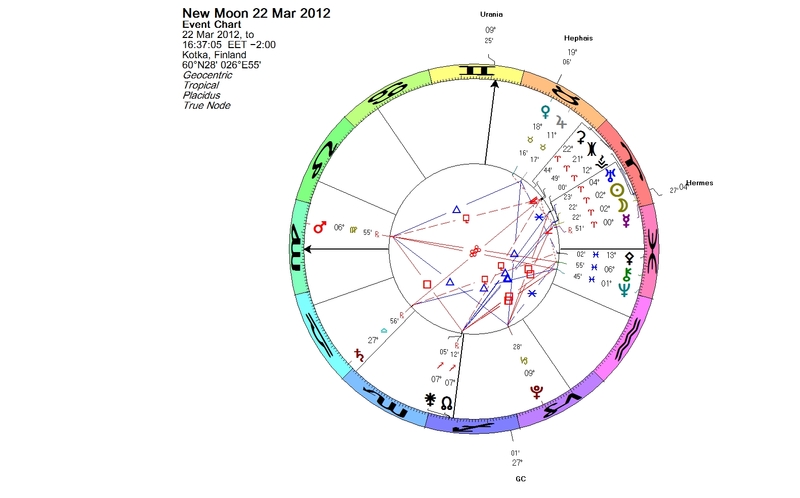 This entry was posted on Thursday, March 22nd, 2012 at 4:39 pm	and is filed under New Moon. You can follow any responses to this entry through the RSS 2.0 feed. You can leave a response, or trackback from your own site.